Winter Highlights : 5 Cardigans To Count On - BREVILOQUENT. A winter addition to most women’s wardrobes , the cardigans are another way to layer up this season. 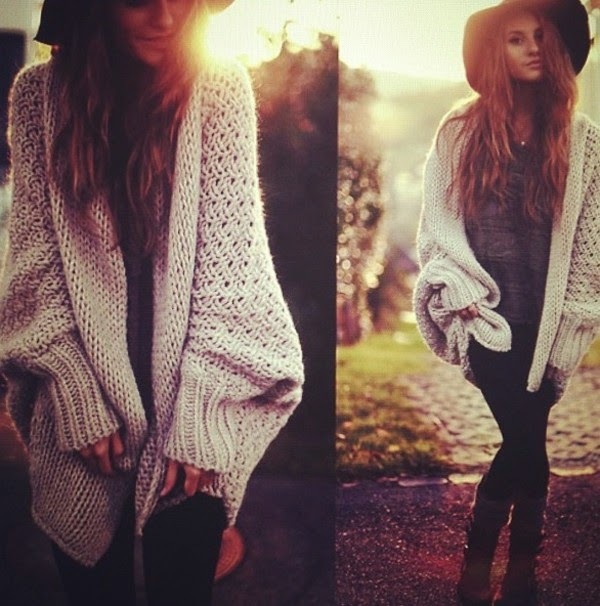 Cardigans can make any outfit look cute or hot depending on the type of cardigan and the outfit it is paired up with. Adding an extra layer of comfort to the look, cardigans work well, making it a smart investment. A white sweater goes with everything and the black variety is undeniably chic, but combine black and white into a flattering stripe and you’ve got a sweater that packs a powerful fashion punch! Break out of the solid –colored sweater rut with a black and white pullover or a cardigan this season. Cable knit sweaters are your absolute best friends when it comes to warm yet polished outfits. This ‘wear-with-everything’ pullover can be dressed up and down and can be worn to the office and even down to the streets. From chunky oversized to cropped, belted or squared cable knit sweaters, this basic looks sophisticated and stylish. Time to channel your inner free spirit: kimonos are a very boho look. The kimono may be a little difficult to pull off, but, it can be done. There are many different styles of kimonos available. They’re not limited to one season, you can wear them throughout all four seasons (as long as you change the rest of your outfit, of course). It’s easy to pair with a blank tight pant, shorts, or even a dress, as the weather gets warmer. Try it on? What’s a great way to liven up a simple jeans and a tee-shirt look? A kimono fringe cardigan, of course! Nothing says boho lass like some fringing, and what better way to rock it than with some black shorts or jeans and a pair of cowboy boots. This look is festival ready and you can't go past the bandanna tee for off-duty cool. Knitted garments are fast becoming the hottest weave to wear and the batwing cardigans have a lush range. A versatile cardigan with a twist, this oversized cardigan is a definite wardrobe must-have. Settle in and snuggle up, its about to get comfortable, in the best way possible.